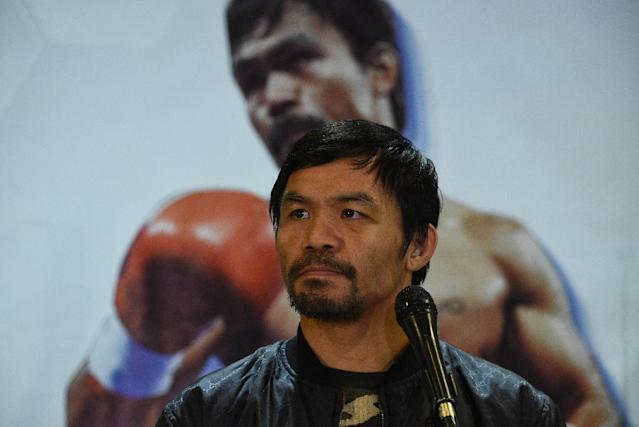 Manila (AFP) - Philippine boxing legend Manny Pacquiao took to social media to poll millions of fans on who they think should be his next opponent, having brushed off calls to hang up his gloves after turning 40. "Who should I fight next?" the world's only eight-division champion asked in a Twitter survey that drew 27,380 votes after five hours and listed Floyd Mayweather, Keith Thurman, Danny Garcia and Shawn Porter as the choices. The poll, also linked to Pacquiao's Facebook wall, has 18 more hours to run. It did not indicate how the voting had gone so far. Pacquiao, who has 2.51 million followers on Twitter and 11.76 million on Facebook, is known to have been angling for a rematch with Mayweather, who beat the Filipino on points in the world's richest prize fight in 2015. Pacquiao's decisive victory over American fighter Adrien Broner in January was supposed to have opened the door to that route. But the unbeaten Mayweather, officially retired, has been non-committal. Many Facebook users urged Pacquiao, who has 61 wins including 39 knockouts against seven losses and two draws in a 24-year career, to fight Mayweather. "Floyd of course then retire," Carlos De Luna Lagunsad added. But another fan urged the 40-year-old to face International Boxing Federation welterweight champion Errol Spence, who easily beat challenger Garcia in a match between two previously undefeated boxers on Saturday. "Show this young guys why u r a living legend," Meg Osh Tin Oniuqa said.